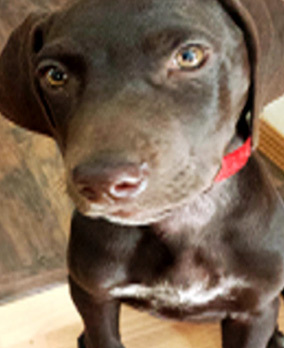 Bunker is an approximately 12 week old German Short Hair Pointer that was obtained from a litter in Minnesota. He and a littermate were held back from being sold as they were considered too small and didn’t seem to be flourishing. Big Paws Canine White Team had just been approved to obtain another pup to bring into foster care for training to be a Service Dog. Bunker is being fostered by Courtny Nesheim and trained daily with the assistance of her therapy trained dog, Pugsley . Bunker also joins the group classes every Monday to work on basic skills and socialization . As the photos show… Bunker is bright, intuitive, learning his basic commands and has a connection to Jerry that is heartwarming. He also seems to have beaten the odds and is definitely flourishing . Bunker is waiting for his perfect match… he’s a task driven Service Dog in training who excels at “carry” and “pick up” items for a person with mobility issues that doesn’t necessarily need one of the larger breeds for stability.